Implicit methods can be made to have smaller truncation errors and better stability properties than explicit methods [Lambert, 1973], so it is desirable to have some method of finding fn+, to enable an implicit method to be used for nonlinear equations. The usual procedure is to use an explicit method, known as a predictor, to calculate y„+v Then fn+1 is evaluated and an implicit method, known as a corrector in this application, is used to obtain a refined value of/n+1, followed by a second evaluation of fn+i using the new yn+i. Methods in this general class are called predictor-corrector methods. The mode of application described above is the PECE (predict-evaluate-correct-evaluate) mode; it requires two function evaluations per step. It is also possible' to apply the corrector more than once after a single use of the predictor, but analysis indicates that the PECE mode is preferable, and that decreased truncation error is better achieved by decreasing the step size than by multiple applications of the corrector [Lambert, 1973]. If values of y are needed at intermediate times and an Adams integrator is being used, it is convenient to employ an interpolation algorithm based on values of /„ rather than^„, because the former already have to be stored for the integration routine. In either the Runge-Kutta or the predictor-corrector calculations, some of the function evaluations may be done approximately rather than exactly (by not recalculating torques, for example) to save computational effort. These are called pseudoevaluations, and are represented by E*, so one often reads of a PECE* mode of a predictor-corrector. In choosing an integration method, the factors of programming complexity, computer storage requirements, execution time, and computational accuracy must all be considered. For a specific application where the characteristic frequencies of the system are known to be nearly constant, a fixed-step method is indicated. If the step size is limited by variations in the driving terms rather than by integration error (noisy input and/or low-accuracy requirements) or if function evaluations are relatively inexpensive, a Runge-Kutta method is preferred. If, on the other hand, the integration step is set by integration error (smooth input, high accuracy), or function evaluations are expensive, a predictor-corrector method is better. Adams methods are favored in this class because they combine good stability properties with relatively low computer storage requirements and programming complexity. If the characteristic frequencies of the system are not constant, a variable-step method should be used. A complete integration package in this class must include an algorithm for automatic step size variation, based on an estimate of local truncation error. Because predictor-corrector methods provide an automatic estimate of local truncation error, they are the preferred variable-step methods. The best general-purpose integration methods currently available are packages with variable-step and variable-order Adams-Bashforth-Moulton integrators (see Hull, et al„  and Enright and Hull , which also include comparative tests of integration packages using a wide variety of test cases). where T is the sampling interval (T= tn+, - /„); i2n is Eq. (17-3) evaluated at time tn; q(tn) is the attitude quaternion at time /„; and q(tn+i) is the propagated attitude quaternion at time /n + 1. The validity of Eq. (17-17) as a solution to the kinematic equation can be established by differentiation. and 1 is the identity matrix. For spacecraft gyros the sampling period is typically 100 to 400 nis. Because of the simplicity of Eq. (17-18), the closed-form solution has been used as, the kinematic integrator for onboard computers [Fish and Chmielewski, 1977]. The gyro system is usually a rate-integrating gyro package which provides an average angular velocity vector over the sampling period (see Section 6.5). The term inside the brackets in Eq. (17-18) is then an orthogonal rotation which retains the normalization of the propagated attitude quaternion. The series of terms in the first bracket on the right-hand side of Eq. (17-21) is the Taylor series expansion of expf|i2B7"]. The remaining terms constitute the error introduced for a sampling period T in assuming a constant body rate equal to u„. which differs from Eq. (17-17) in using time-averaged rate information rather than instantaneous body rates. It can also be written in the form of Eq. (17-18), with fi replacing Q„. Equation (17-23) shows that the error in this clostd-form expression is of order T3 and vanishes if 8n8n = or equivalently, if the vectors w„ and_tb„ are parallel. Thus, the order T3 correction to the closed-form expression using S2 is zero if the axis of rotation is fixed, even though the rates may be time dependent. As described in Section 17.1, attitude prediction requires a model of the environmental disturbance torques acting on the spacecraft. To numerically integrate Euler's equations, the torque must be modeled as a function of time and the spacecraft's position and attitude. As listed in Table 1-2, the dominant sources of attitude disturbance torques are the Earth's gravitational and magnetic fields, solar radiation pressure, and aerodynamic drag. Any nonsymmetrical object of finite dimensions in orbit is subject to a gravitational torque because of the variation in the Earth's gravitational force over the object. This gravity-gradient torque results from the inverse square gravitational force field; there would be no gravitational torque in a uniform gravitational field. 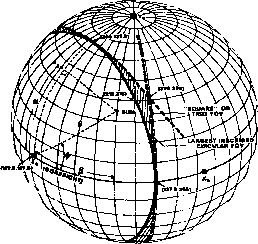 General expressions for the gravity-gradient torque on a satellite of arbitrary shape have been calculated for both spherical [Nidey, 1960; Roberson, 1961; Hultquist, 1961] and nonspherical [Roberson, 1958b] Earth models. For most applications, it is sufficient to assume a spherical mass distribution for the Earth. If more accuracy is required, this may be obtained from the general potential function for the Earth given in Section 5.2. Alternatively, the effect of the Earth's oblateness can be accounted for in the motion of the orbital plane [Hultquist, 1961; Holland and Sperling, 1969].